Removing BGP Private ASNs – Revisited! Recently, I posted about some lab verification I did during a customer setup where I had to strip private BGP AS numbers (64512-65535) before sending BGP-learned prefixes upstream to an ISP. While I used the purpose-built “remove-private-as” neighbor command, several readers commented to me via the blog and via Twitter with some ideas for alternate solutions. They even got me thinking about an idea of my own. @BobMcCouch 2 other solution could be , AS-Path prepend last AS , and as override I think. Did you consider the possibility to use confederations for that? The result would be the Seller_Corp AS as confederation main AS and the Buyer_Corp AS a confed private AS, so “invisible” to the external peers. I’m always a fan of coming up with multiple ways to do something. It stretches your mind a bit, and it can be good to have plans B, C, and sometimes D in case Plan A doesn’t work out. As hard as it was, this one something I really enjoyed when preparing for the CCIE lab — coming up with all those twisted ways to pull something off. Even though I had some opinions on which of these might or might not work, I decided to run each of these test cases through my lab. This is one of the beautiful things about virtual labs (like the forthcoming Cisco VIRL), you can save a complete topology — connections, configs, and all — and load it back up in the future for more testing. Again, this works from a connectivity standpoint in the lab but in real life ISP’s BGP policy would prevent this from working. Unfortunately this one is a no-go. It simply prepends the AS_PATH using the ASN of the most-recently-appended (or next-hop) AS on the prefix, rather than some arbitrary list. You may even notice that the command reference entry for this command is under the MPLS section and not the BGP section of the Doc-CD. That’s because this is an MPLS VPN-specific feature. It’s only applicable under the IPv4 VRF BGP address family. It’s intended for PE-CE routing in the case where all customer sites in the VPN have the same ASN assigned by the provider. In fact, as I recall, it only works by replacing any occurrences the eBGP neighbor’s ASN in the AS_PATH with the local ASN during an advertisement so VRF requirements aside this would probably only work if the ISP was using the same ASN as BUYER. Now we’re on to something! 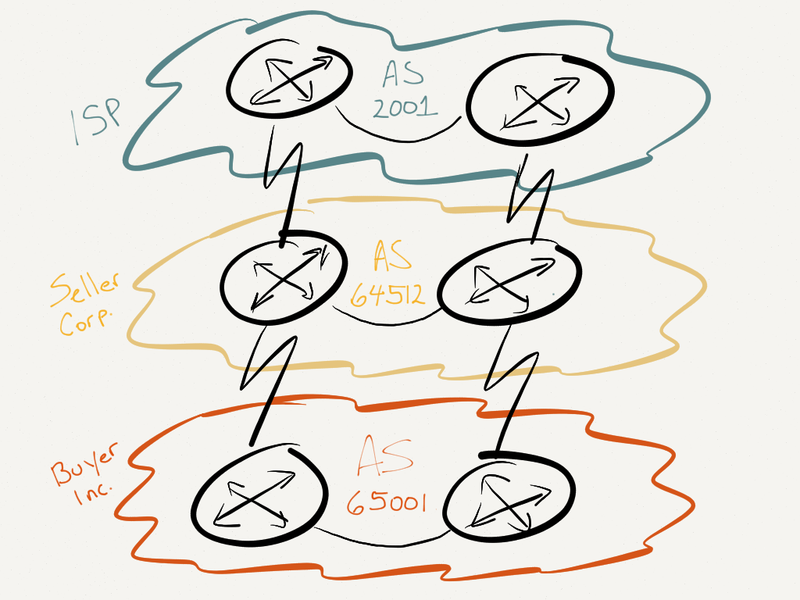 BGP confederations can absolutely do exactly this… they provide a means for several “sub-AS” networks to work together and pretend to external networks that they are really one. Here’s the setup for this. I recommend reading up on BGP confederations if you’re not able to figure out roughly what the commands are doing. Any CCIE candidate should be well-familiar with confeds. So this is a viable option. I still wouldn’t have used it. Why? Mainly because for my use case it’s like using a wrench to hammer in a nail. It will work, but it’s awkward. The two networks I’m working on here are not really one. They are separate businesses, intending to operate separate networks, under separate administrative control and policy. They just have to cooperate for a few months. Using a confederation would require basically telling the BGP routers from both networks that they’re really part of the same club. That changes some of their BGP behaviors, and it’s just not reflective of how the networks really operate. So big kudos to Jerome for coming up with a working alternative, totally fit for a CCIE scenario! But I don’t see the value gained in exchange for adding this complexity/weirdness for my specific scenario. Any time you’re evaluating design options for production networks, take a few minutes to consider some alternatives. Sometimes the other ideas you come up with just flat out won’t work. Sometimes, they may be valid but may not be the best solution. And sometimes, you’ll realize there is a better option than your original idea. If you consider these options up front (and take the time to lab validate them, if needed), you’ll be less likely to wonder if you should have taken a different course of action and you’ll also have some ground to stand on if your chosen design is challenged by someone since you can show that you evaluated several options and ultimately chose the one you implemented. You also get the benefit of exploring features or use cases that may not be a help this time around, but could serve you well in the future. Again, very interesting post Bob, and it’s great from you to have tested the suggested alternatives and explained why you choose one. Assume you have control of AS300 only. You can ask AS200 to make config changes to manipulate how AS-paths look on export to you. 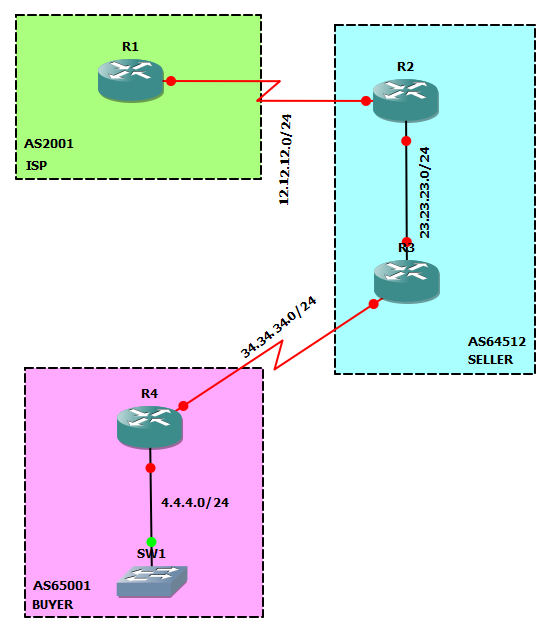 Each unique AS is a discreet routing domain, You don’t have the option of coordinating with the other ASNs for configuration changes. AS50, AS100, AS200, AS300 are all public ASNs. The rest are all private. As the administrator of AS300 you don’t want to accept a route with a path containing a private AS. Consider this set of AS paths as an example of what AS200 is sending to you without any AS path manipulation. How would you make AS200 hide just the private ASes? Finally got a couple minutes to lab this up and verify my solution. Assuming AS200 is running fairly recent code, by far the easiest way is to ask them to add “neighbor remove-private-as all” to your eBGP session with them. That recently added keyword removes all private ASNs in the AS_PATH even if they are non-contigous. Do you have a solution in mind for older IOS that may not support the “all” keyword?